What Health and Exercise Mean to a Paralympian – Road to the Paralympics – Tokyo 2020! About the author: Travis Gaertner was born without a left leg and with only half of his right leg. Being in a wheelchair hasn’t stopped him from being extremely active. 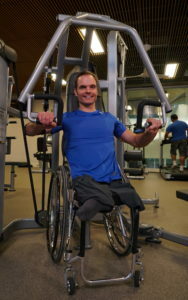 Gaertner has won two Paralympic gold medals in wheelchair basketball and is training for a spot at the 2020 Tokyo Paralympic Games in handcycling. Find out more about Gaertner’s quest. Health and exercise mean a more enjoyable lifestyle in many ways. It’s not just for the elite athletes who have a need to feed their competitive drive, but for the doubter who feels they don’t have enough time or energy to get it done. I’ve experienced both ends of the spectrum in my life. As a disabled elite athlete, activity gives me an outlet to fuel my competitive nature day in and day out. I love the challenge of trying to achieve measurable gains every week. This is a high objective for me and doesn’t change during family vacations, business travel, or at times when life is in its busiest phase. But it goes much further than that, given I was born without my left leg and half of my right leg. At the age of almost 40, I could likely get away with avoiding exercise all together for a while. But what happens if I injure one of my three remaining limbs? Or, what does life look like as I age and simply have less strength? I’ve never let anybody push me in my wheelchair or pick up my bags at the baggage carousel. I enjoy an independent lifestyle and I really don’t want to lose that. I have control now, to stay healthy and help minimize any losses in my lifestyle later in life due to events I may not have control over. I have three beautiful young children who want me to pick them up, wrestle, and play with them. I want them to have a father who can remain very active with them 20 or more years from now as a 60-year-old in a wheelchair. One doesn’t need to maintain a world-class training schedule to reap these benefits. Some basic and limited strength and conditioning goes a long way to increase your energy levels overall. It allows you to enjoy the ability to do more things for longer. In periods of my life where I felt I didn’t have the energy to either get up to exercise or do it at the end of a long day when my body is tired, I’ve felt less energetic in general as I went about life’s day-to-day activities. It can feel counterintuitive when your body tells you it’s tired at the end of the day. Your perception is often that rest is the best thing. While rest is very important, without combining it with an active lifestyle, we are able to do much less while feeling more tired. This new year, find a way to get active in a way that is sustainable with your schedule. Don’t jump from nothing to two-a-days, or even to working out six days a week. Sit down and figure out what fits best into your lifestyle and be honest with yourself about your ability to remain consistent. I promise the extra time and effort will eventually result in somebody who can get more done at a higher level of energy.